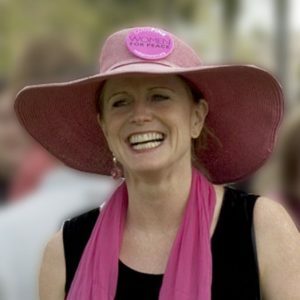 Jodie Evans is co-founder and co-director of CODEPINK and has been a peace, environmental, women’s rights and social justice activist for forty years. She has traveled extensively to war zones promoting and learning about peaceful resolution to conflict. Evans is the board chair of Women’s Media Center and sits on many other boards, including Rainforest Action Network, Drug Policy Alliance, Institute of Policy Studies, Women Moving Millions and Sisterhood is Global Institute. She is the mother of three.